It is distributed to all members free of charge. The electronic version is freely available at: www.ilnuovosaggiatore.sif.it starting from 2016 in HTML and PDF. From 2000 to 2015 included only the PDF version is available. The contents can be accessed through APP. 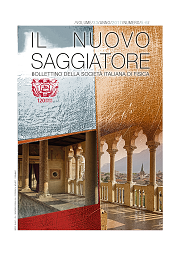 "Il Nuovo Saggiatore" is the bulletin of the Italian Physical Society. It began publication in 1956 with the name of "Bollettino della Società Italiana di Fisica", and had the limited function of distributing information on the social activities to members. It was in 1984 that it completely changed its aims and was relaunched as a new scientific journal with the title "Il Nuovo Saggiatore". Besides general information for members, it publishes mainly in Italian, news on recent studies from Italian and foreign Universities and laboratories as well as from industrial laboratories.